Group size in wedge-capped capuchin monkeys (Cebus olivanceus) :vulnerability to predators, intragroup and intergroup fe..
vii, 126 leaves : ill. ; 28 cm. 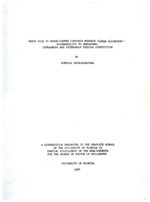 Includes bibliographical references (leaves 116-125). another, I owe my favor and gratitude to a number of people. a good atmosphere for research. Tomas Blohm was a tireless host. Research, a Friend of National Zoo award to Dr. Eisenberg and Dr.
computer facilities. Gustavo Fonseca, Jody Stallings, and Dr.
(NERDC) IBM mainframe of the State University System of Florida. groups that range in size from five to more than 40 animals. population has been the subject of a long-term study since 1977.
alleviating the effect of intragroup feeding competition. There is also among-group variation in foraging success. feeding efficiency than solitary animals. and a number of predictions based on these hypotheses are tested. species ideal for a test of these hypotheses are presented. in Hanuman langurs, Presbytis entellus (Table 1-1). of the number of studies on these genera. monkey, C. aethiops; Table 1-1). demographic processes: birth, immigration, death and emigration. and not on group size per se (Altmann and Altmann, 1979). Group Living in Primates: Food or Predators? relationships. The result is the "female-bonded group". their kin, or they should switch from high to low quality food. hypothesis ignores any benefit of intergroup feeding advantage. than 40 animals (Robinson, 1986; this study). the wet season (Robinson, 1986). groups must compete directly for the same resources. behavior and demography are already available. llanos of Venezuela, a cattle ranch owned by Sr. Tomas Blohm. 1985; Austad and Rabenold, 1985). classified broadly as dry tropical forest (Ewel et al., 1976). forests on loamy sand, loam, and clay soils, respectively. the palm Copernicia tectorum and the guacimo Guazuma tomentosa. space, and bear fruit in a very seasonal manner (Robinson, 1986). (1976), Troth (1979), and Sarmiento (1984). study on demography and social organization of this species. changed little between Robinson's and my study period. for ecological studies (see Hurlbert, 1984; Hawkins, 1986). periods during 1983-1984 can be seen in Figure 2-2. Observations on other groups were made opportunistically. greater in large groups than small groups. different seasons will be compared. of observations were made on each group. April 1984 in the dry season. seconds after the animal was first located in each sample period. No individual was sampled more than once in a sample period. 25 meters. The trail system was approximately 60 km long. mainly in the northern part of the study site (Figure 3-1). approximated location of a center of a group. from straight ahead between consecutive half-hour movements. in primate studies (Waser, 1976; Robinson, 1986). locations in a specified period of time. categories may reflect different foraging microhabitats. and identity of nearest neighbors was noted whenever possible. The distance was estimated in 1 m intervals up to 10 m.
classified as to animal or plant origin. were shown to me by Dr. Robinson at the beginning of my study. contrast, food of animal origin was rarely identified. animals in larger groups should spread themselves out more. instantaneous samples, n =378 instantaneous samples, p>0.1). interactions was significantly different (t-test, 14df, p<0.01). groups should have lower invertebrate foraging success. test, ldf, p<0.01 for all categories). should allow less time for animals in larger groups to rest. The length of the day-range in the LARGE group was longer. test, n =734 records, n =725 records, p<0.01, Figure 3-2). turning angles in smaller groups. N C M q* . larger groups would have larger group ranges than smaller groups. of the LARGE group was always larger (Figure 3-4). scarcity. Emigrants should be adult females. group (Table 2-2, 2-3) were recorded. chi-square test, ldf, p<0.01 for both groups). groups would be higher during the period of food scarcity. p<0.01 in the SMALL group). food, by definition, is more dispersed in the environment. foraging (sensu latu) during the dry season. season (chi-square test, ldf, p<0.01). and dry seasons respectively (chi-square test, ldf, p<0.01). during the dry season, animals should spend more time moving. are foraging on homogeneously distributed resources. should also affect half-hour turning angles between seasons. distributed food in the diet. records, n =199 records, p>0.1 in the SMALL group). Davidge, 1978; Makwana, 1978; van Schaik and van Hooff, 1983). capture success but did affect fruit feeding. groups. Large groups also use larger areas. of access to resources (see Chapter V). competition on social living (Chapter V). ground (=0), 1-5, 6-10, 11-15, and 16-20 m from the ground. calls in the presence of aerial and terrestrial predators. and SMALL groups were 7.3 and 9.9 m respectively (Table 4-1). than the SMALL group throughout the day (Figure 4-1). feeding competition (see chapter III). time in vigilance during the dry season than the wet season. ground and % of records on ground in both groups. I i I i I A .
the dry season (0.2%) (chi-square test, ldf, p<0.01). by spending more time off the ground. than the dry season (Table 4-1). less available as a foraging microhabitat. on the ground (van Schaik et al., 1983a; de Ruiter, in press). of one and more than one: chi-square test, ldf, p>.0.1). able to take the monkeys (Chapman, 1986). species usually emit loud vocalizations that maintain spacing. et al., 1965), but not in C. albigena (Waser, 1977a). animals in large groups have a greater access to resources. unhabituated while others had been censused regularly since 1977.
noted the locations of followed groups every half-hour. space were from the 14 paired sample periods. recorded all social interactions whenever they were noted. occurred I noted down time and location of encounters. half-hour locations in a specified period of time. also assigned in the same quadrat system as above. data on the distribution of fruit trees from the study by Dr.
Robinson and new data obtained at the end of my study were used. quadrats or 50.6 % in the SMALL group's range. noted the location every half-hour. 5, 6-10, 11-15, and 16-20 m from the ground. of trees was obtained from Robinson (1986). versus 50% of days during the dry season (n =10 days)). displaced was the BROWN group, another small group of 10 animals. to LARGE group, the CHESTNUT group was smaller. a large number of other groups. group always displaced the SMALL group. effect on time budgets in larger groups. season (chi-square test, ldf, p>0.01). groups should also be altered by intergroup encounters. n=355 records, n=379 records, p>0.1). group, it was 54.3 (with median=39.0 SD=49.40 n=14 records). and SMALL groups is 0.4099.
hour steps after intergroup encounters in both groups. May 23 and June 29, 1984.
concentrate their activities in certain areas. its time more evenly over its range than did the SMALL group. 75 per cent of its time respectively (Figure 5-9). use of space by different groups should be negatively correlated. groups would be negatively correlated. 7$%/( '(02*5$3+,& &+$1*(6 ,1 7+( 60$// *5283 0$< -81( 'DWH &KDQJH $QLPDO 1HZ JURXS VL]H -XO\ %LUWK ) )UDQFH ERP WR )XUU\ )DFHf 0D\ 'HDWK $GXOW ) 0DUJDUHW -XO\ ,PPLJUDWLRQ 6XEDGXOW 0 &KDUOLH $XJ 'HDWK $GXOW ) %DUH 6KRXOGHU 6HSW (PLJUDWLRQ 6XEDGXOW 0 &KDUOLH 1RY 'HDWK $GXOW ) %HUHW )HE 'HDWK"